Every day ups and downs, a diabetes blog: 25 not out - stick THAT up your nose diabetes! 25 not out - stick THAT up your nose diabetes! At some point during the last week (I'm not entirely sure which day) I made my quarter century of living, more or less successfully, with type 1 diabetes. Twenty five years later and I've still got both feet, my eyes are pretty much unscathed and my kidneys still seem able to cope with clearing up after all the stuff I throw at them. Not a bad effort. I confess I was slightly surprised at the findings. I suppose in a sense there is a certain logic to them, older people will have any residual 'helping hand' action from their own pancreas long gone, and more opportunity to have succumbed to a degree of hypoglycaemia unawareness. Still a bit odd that incidence of severe hypoglycaemia looks to increase year on year though - I would have expected a good deal of difficulty in managing BG in early childhood (tiny doses... erratic hormones... growth spurts... irregular physical activity) and certainly during teenage years (rebellion... wanting to fit in... more growth spurts and raging hormones). Even during young adulthood and middle years there's a degree of chaos going on with life in general. Particularly if people become parents themselves - when focussing entirely on yourself tends to slip into the background, replaced with sleep deprivation and general exhaustion. By contrast my own life seems to have become slightly more settled post-40. Much more time to sort out my own stuff. When we began writing our blog it was not at all uncommon for Jane to have to help me out early in the morning from a nasty low (thanks Lantus!). When I look back, I am ashamed that I put everyone through this for so many years and did not sort it out earlier. But thanks to the support, wit and wisdom of the DOC, over the last few years I have gone a long way to reduce my hypoglycaemia in general and severe hypoglycaemia in particular. I can't remember the least time I got so low that someone in the family had to lend me a hand - but it was probably three or four years ago. I for one have exactly the opposite experience of the T1D Exchange findings. What about you? If you are living with type 1, are you seeing more or less severe hypoglycaemia than before? 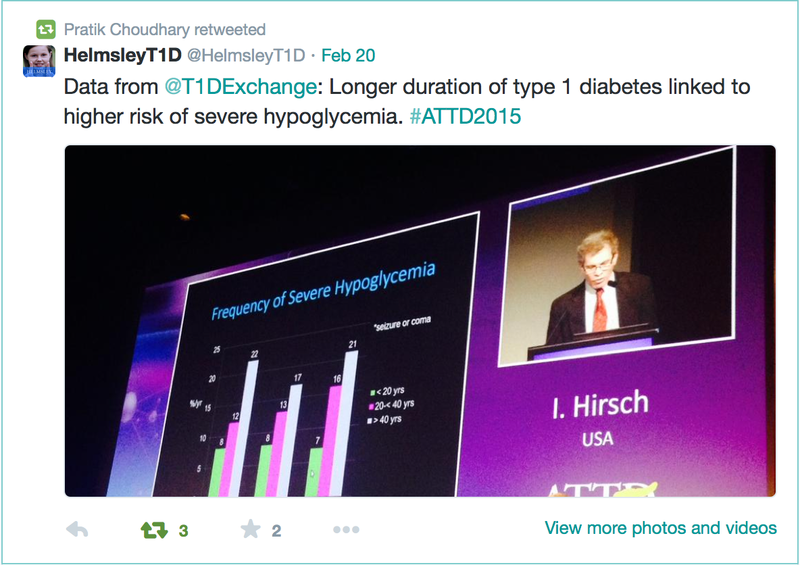 Should we accept an increase in severe hypoglycaemia as inevitable*? * The answer, of course, is NO! The second thing that caught my eye came as an email, following a presentation at the Advanced Technologies & Treatments for Diabetes (ATTD) conference in Paris last week, concerning a novel new glucagon treatment that is in development. Glucagon is used as an emergency treatment for severe hypoglycaemia. Currently it involves injecting sterile water into a vial of powder, mixing into solution and injecting into a person who has become so hypoglycaemic that they are either unconscious or otherwise unable to consume any high glucose treatment. Glucagon is a great treatment, but the current delivery method is pretty complex. I first came across the 'nasal puff' concept via Mike Hoskins in the US, who posted on Diabetes Mine following involvement in a trial of the device. It's ingenious! Developed by a tiny private company with parents of T1D children at the helm, it seems driven by passion and practicality. I know that when I have tried to mention Glucagon kits to anyone among my family and friends they immediately take on a distinctly 'rabbit in the headlights' expression and start mumbling about "erm... yes... or I'd call an ambulance". The idea that at a time of extreme stress, possibly in the middle of the night, someone entirely untrained in giving injections would be able to calmly proceed through a multi-step process of mixing, drawing up, selecting injection site and administering (especially if I were thrashing about) seems crazy. This new treatment involves simply 'puffing' dry powder up the nose. 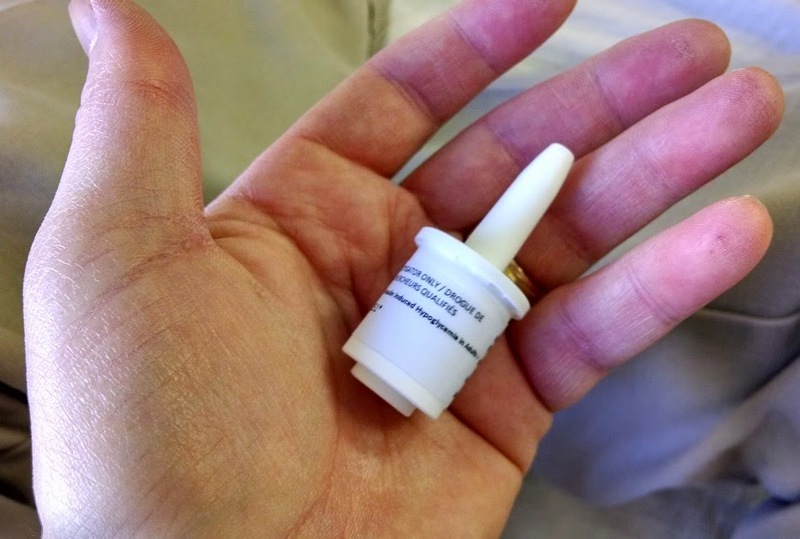 It doesn't need to be inhaled (designed for people who may be unconscious), simply pushing the base of the container ejects a cloud of dry glucagon into the nasal passages where it is absorbed directly. No needles, no mixing, no faffing about in the dark. The device is not currently available, but phase 3 clinical trials are currently underway and I will watch the story with interest. Disclosure: I was not paid to mention Locemia's nasal glucagon device (ha! chance would be a fine thing!). It just sounds like a great idea. That's very interesting. It'd be interesting to see how this turns out - perhaps keeping a glucagon kit on standby that's easy to use can prevent severe hypoglycemia hospital admissions. Another technology I'm watching very closely is the no-needle continuous glucose monitoring sensor by Abbott - it's released in Europe already. Very cool. Yau Teng Yan - do you mean the Abbott Freestyle Libre? I've blogged about that before. Not entirely true to say it is 'no needle' because the sensor is inserted with a needle initially and does sit under the skin to measure interstitial glucose. After that though... only NFC scan's required. It's great!